Hot on the heels of the last release, we’ve released Atom v1.10 and v1.11-beta! A few commonly used inputs and other controls got added. Open the Style Guide in Atom to see how you can use them in your package or further style in your theme. For a comprehensive list, don’t forget to check the release notes! 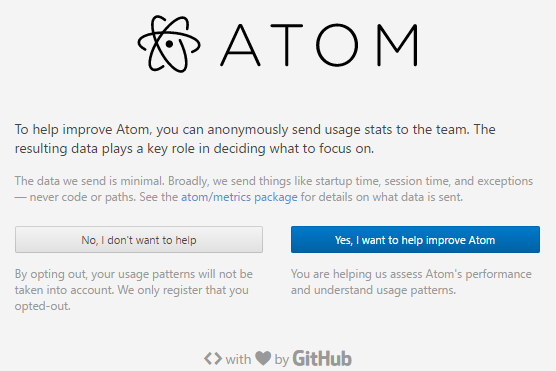 This version features performance and stability improvements and, in particular, we’re excited that Atom now asks for permission before sending any telemetry data. This is something that a lot of users have been asking for. We’ve always had ways to opt out but it is only right to make it obvious and clear. Now it is! Again, don’t forget to check out all the other improvements shipping with this version in the release notes!